Astoria is a ship rich in history and quite a venerable old lady of the seas. 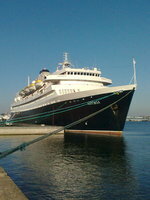 We had cruised on her before, in 2012 when she was operated by CIC and named Athena. It was fascinating to see that little had changed in the public spaces, 6 years and 2 owners later, but the cabins have had some upgrading and the ship now has different external colours. I was amused to note that one of the bathroom towels in our cabin had the CIC logo embossed on it - they went out of business in the autumn of 2012. Embarkation at Portsmouth was the smoothest and quickest that we had ever experienced. We arrived at the port slightly in advance of our allocated embarkation time, but were given our cruise-cards and were on board the ship within minutes. CMV use a different system at Portsmouth on Astoria than they do at Tilbury, as the main processing is done on board the ship rather than in the terminal. Even so, this further processing also only took a matter of minutes and we received our cabin keys very swiftly. Astoria uses the rather dated punch-card type cabin keys, and they have the cabin number on the back of them, so you have to be very careful not to misplace one on board. 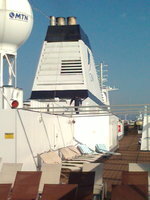 We used the gym facilities which are very minimal, just 4 machines, but there were few other users even though the ship was sailing at full capacity. The Spa on Astoria has two treatment rooms plus a hairdressing salon. We each bought a treatment, taking advantage of a 10% discount offer for bookings made on the first day of the cruise. The treatments were very average, and we probably would not bother again if we cruise on Astoria in the future. The small entertainment staff worked very hard throughout our cruise to make the evenings enjoyable, and I personally was very impressed with the amount of multi-skilling that they employed to keep the show schedule running. The &apos;Mr & Mrs&apos; quiz in particular was very funny and gave the audience a lot of laughs. Astoria also has a separate auditorium which is used for lectures and the showing of feature films; both of us felt that this excellent resource was rather under-utilised and many more films could have been shown than actually were. We dined mainly in the Olissippo Restaurant and had superb meals throughout our cruise. Astoria operates fixed-dining with 2 sittings; the Lotus Grill self-service buffet also has a selection of the same menu items on offer for those who need or prefer to use it. We avoided this buffet area at breakfast times as it seemed to be rather a bun-fight, also suffering with constant shortages of mugs for the tea & coffee service station at busy periods. I was very pleased to see that CMV still use &apos;Eilles&apos; tea; their excellent &apos;Vanilla Rooibos&apos; is almost worth doing a cruise for on its own! &apos;Afternoon Tea&apos; is offered only in the Lotus Grill. The ship&apos;s crew - in general - were very helpful and friendly, especially the Lotus Grill serving staff who always seemed to have a smile ready. None of our ports of call involved tendering, so I cannot comment on the efficiency or otherwise of this process on board Astoria. The CMV staff were very good at making prompt announcements upon arrival at each port, informing the passengers as soon as possible that they were free to go ashore. Disembarkation was equally smooth and took around 90 minutes for us, but once we got into the terminal the collection of luggage was easy and quick. CMV use &apos;CPS&apos; for parking at Portsmouth; they are efficient and the process of leaving & collecting our car was completely painless. Astoria is a ship rich in history and quite a venerable old lady of the seas. We had cruised on her before, in 2012 when she was operated by CIC and named Athena. It was fascinating to see that little had changed in the public spaces, 6 years and 2 owners later, but the cabins have had some upgrading and the ship now has different external colours. I was amused to note that one of the bathroom towels in our cabin had the CIC logo embossed on it - they went out of business in the autumn of 2012. Embarkation at Portsmouth was the smoothest and quickest that we had ever experienced. We arrived at the port slightly in advance of our allocated embarkation time, but were given our cruise-cards and were on board the ship within minutes. CMV use a different system at Portsmouth on Astoria than they do at Tilbury, as the main processing is done on board the ship rather than in the terminal. Even so, this further processing also only took a matter of minutes and we received our cabin keys very swiftly. Astoria uses the rather dated punch-card type cabin keys, and they have the cabin number on the back of them, so you have to be very careful not to misplace one on board. We used the gym facilities which are very minimal, just 4 machines, but there were few other users even though the ship was sailing at full capacity. The Spa on Astoria has two treatment rooms plus a hairdressing salon. We each bought a treatment, taking advantage of a 10% discount offer for bookings made on the first day of the cruise. The treatments were very average, and we probably would not bother again if we cruise on Astoria in the future. The small entertainment staff worked very hard throughout our cruise to make the evenings enjoyable, and I personally was very impressed with the amount of multi-skilling that they employed to keep the show schedule running. The &apos;Mr & Mrs&apos; quiz in particular was very funny and gave the audience a lot of laughs. Astoria also has a separate auditorium which is used for lectures and the showing of feature films; both of us felt that this excellent resource was rather under-utilised and many more films could have been shown than actually were. We dined mainly in the Olissippo Restaurant and had superb meals throughout our cruise. Astoria operates fixed-dining with 2 sittings; the Lotus Grill self-service buffet also has a selection of the same menu items on offer for those who need or prefer to use it. We avoided this buffet area at breakfast times as it seemed to be rather a bun-fight, also suffering with constant shortages of mugs for the tea & coffee service station at busy periods. I was very pleased to see that CMV still use &apos;Eilles&apos; tea; their excellent &apos;Vanilla Rooibos&apos; is almost worth doing a cruise for on its own! &apos;Afternoon Tea&apos; is offered only in the Lotus Grill. The ship&apos;s crew - in general - were very helpful and friendly, especially the Lotus Grill serving staff who always seemed to have a smile ready. None of our ports of call involved tendering, so I cannot comment on the efficiency or otherwise of this process on board Astoria. The CMV staff were very good at making prompt announcements upon arrival at each port, informing the passengers as soon as possible that they were free to go ashore. Disembarkation was equally smooth and took around 90 minutes for us, but once we got into the terminal the collection of luggage was easy and quick. CMV use &apos;CPS&apos; for parking at Portsmouth; they are efficient and the process of leaving & collecting our car was completely painless. Our cabin was only a Grade 6 &apos;outside&apos; but very spacious, with 2 portholes, making it feel light and airy. The vibration from the ship&apos;s engines was noticeable but not intrusive, and helped to mask the noisy neighbours we had on one side. The cabin insulation on Astoria is poor and if we had been in a quieter area, the noise from neighbouring cabins would have been very irritating. Our cabin steward was something of a disappointment. He seemed friendly enough at first, but it became evident that this was conditional on receiving an additional gratuity at the end of the cruise. I had purchased one of CMV&apos;s advance packages which included gratuities, and did not feel that there should be any obligation to give any more! Perhaps CMV should consider introducing a policy completely prohibiting further gratuities, which would clarify the situation and avoid awkward moments with the cabin staff. The storage area in the cabin was very generous and the bathroom very well-appointed, with a shower over the decent-sized bathtub. Astoria seemed to suffer with constant problems affecting the vacuum toilet system during the first half of our cruise, which resulted in us having to call out a plumber one morning at 03:30 (!) to sort out our non-flushing WC. The repair was effected very speedily, which impressed us although it made for a rather disturbed night&apos;s sleep. During our call in Copenhagen a complete shutdown of the starboard side vacuum toilet system was undertaken in an effort to cure the problem once-and-for-all, which seemed to be effective as we heard of no further &apos;issues&apos;. The cruise pier in Aalborg is right in the centre of this enchanting Danish town. We were made to feel extremely welcome here and thoroughly enjoyed our time ashore. CMV had arranged for a vintage car club to have a &apos;meet&apos; by the terminal and also for a Danish hot-dog stand to provide free refreshments adjacent to the ship&apos;s gangway. We took a short walk from thew ship to the Little Mermaid. We enjoyed a lovely walk from the Altona cruise terminal around the surrounding area. Rather a disappointment compared to Aalborg. The cruise pier is surrounded by containers, there is no terminal building and it was quite a long walk into town. If I was on a cruise that called here again, I probably would not bother going ashore. This &apos;round the harbour&apos; cruise was very informative and the boat was very well-appointed. The departure point was only just across the river from where the ship docked, but we also had a short coach tour of central Rotterdam afterwards.